WASILLA — The Dimond Lynx and West Eagles hockey programs are no strangers to making deep playoff runs. One or the other has played in the state championship game in 15 of the last 18 years, including last year when the two teams collided in the finals, where Dimond took a two-goal victory. A rematch of the 2018 title game came Thursday afternoon in the opening round of the Division I state tournament at the Menard Center. The seventh-seeded Eagles were unable to dethrone the second-seed Lynx, falling 3-2 in the dwindling seconds of the game. The Lynx (18-4) won a face-off on their defending end of the ice with less than two minutes remaining. Teague Porter received a pass while blitzing down right side of the ice with controlled speed. A patient Porter connected with Dylan Hoey, who was streaking down the opposite side. Hoey was able to punch the puck in the net with 85 seconds to go, just a fraction of a second before he and a West defender crashed into the net. The victory lifted the Lynx into Friday’s semifinals. Also advancing were Eagle River, South and Service. 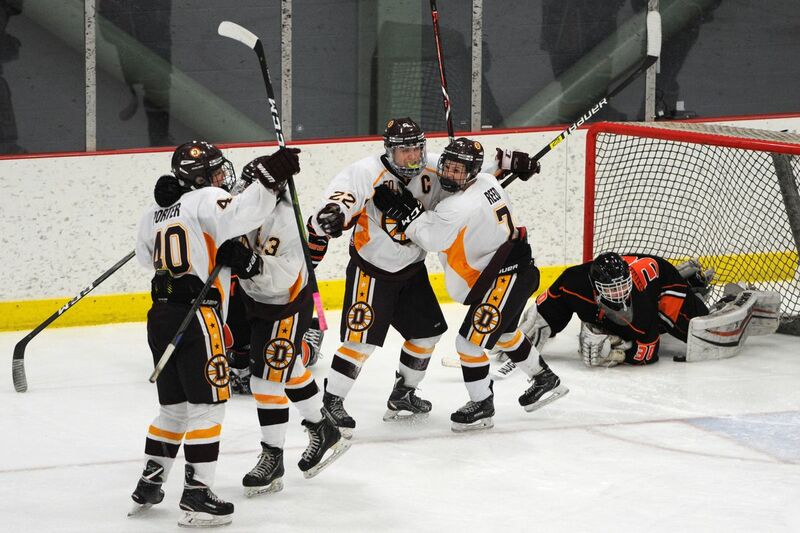 Dimond took control early when sophomore Henry Minich turned on a pass from Tyler Christiansen from near the blue line. Defenseman Jack Dolan gave the Lynx some cushion with another goal when his laser sliced through Eagles defenders to find the back of the net with less than a minute to go in the first period. The Lynx, who were 2-0 against West during the Cook Inlet Conference regular season, looked to bury the Eagles early, but West (10-13) dusted themselves off during the break, and came out in the second period with purpose. The Eagles were able to cut the deficit in half when sophomore Matthew Patchin pocketed a wrister in front of the net. Less than two minutes later, a series of penalties by the Eagles tallied up to 14 consecutive penalty minutes, putting the Lynx on the power play for nearly an entire period. The Eagles were wounded, but did not lay down. Not only did goaltender William Simpson and the remaining Eagles not allow a goal during the extended power play, they were able to put away a short-handed goal early in the third period. West junior Nicholas Opinsky intercepted a pass at center ice and had a clear path to the goalie and place the puck in net to knot the game 2-2 with 12:12 remaining in the contest. That made it anyone’s game, and the Lynx knew they had to close things out. Dimond goaltender Hunter Katness denied 16 shots, while Simpson made 30 saves for West. The Lynx will face the Service Cougars at 7:30 p.m. Friday in the semifinals. The CIC opponents split their regular-season series. For Dimond, it is a new year, but the goal remains the same — hoist the championship trophy at the end of the season, like it did last year. Third-seeded Service used a three-goal first period to coast past the Colony Knights 6-1 and book a Friday night date with Dimond. The Cougars initiated the scoring when Schyler Garrity calmly buried a breakaway goal five minutes into the game. Service began to pile it on, getting a pair of power play goals from Jaden Sarber and Brent Edmondson before the first period was over. The lone goal of the second period came from Service’s Kellen Harris, with helpers from Edmonson and Ben Martensen. For insurance purposes, the Cougars tacked on two goals in the third off of the sticks of Samuel Bourdon and Edmonson, who finished with three points. Colony’s Brett Ewing netted a goal with 10 seconds remaining to avoid the shutout. Service goalie Kevin Tauton shied away 22 shots, while Colony goaltender Roman Shepard had 21 saves. Hayes said the Cougars have what it takes to make a run at the title. "The character we have, we all have such big hearts, it’s a great team really, it really is,” he said. Palmer won’t get a chance to win two state hockey championships on consecutive weekends. The Moose, who earned entry into the Division I state tournament by winning last week’s Division II state tournament, suffered a first-round bruising at the hands of top-seeded South. South outshot Palmer 45-9. Ryan Bailey, Hayden Fox and Dylan Kay scored two goals apiece, and Logan Orr, Josh Costello, Colten Gerken and Rylan Marcum each added one goal apiece for the Wolverines. Hannah Hogenson stopped all nine shots she faced. Eagle River used three power-play goals in the third period and a Logan Dudinsky hat trick to edge Wasilla. The game was tied 2-2 after two periods. The teams traded power-play goals early in the third period, and then Dudinsky gave Eagle River the lead for good with a little more than 10 minutes to go. Dudinsky scored again with 2:25 left in the game to give the Wolves a 5-3 lead. That gave Eagle River the insurance it needed when Wasilla’s Troy Randall scored 13 seconds later for the final score. Christian Brooks and Skyler Johnson also scored for Eagle River. Wasilla’s other goals came from Langston Bouma, Zachary Roush and Larson McKinley.